Youth League Softball Skills and Drills Vol. 1 - Fielding This informative DVD presents the essential fielding fundamentals a softball player needs to compete successfully. Coach Christina Steiner-Wilcoxson teaches players key techniques and provides a wide variety of unique training tips for practicing and mastering the basics of fielding. Among the topics covered are: Transition Tennis Ball Drill, Cone Drill, Diamond Drill, Forward and Backward Footwork Drill, Outfield Fielding Drills, The Z Drill and Diving Drills. Each fundamental skill is taught in a progressive manner that will maximize practice time and player improvement. The techniques and training methods in this program have been instrumental in helping to create successful players at all levels! 58 minutes. 2018. 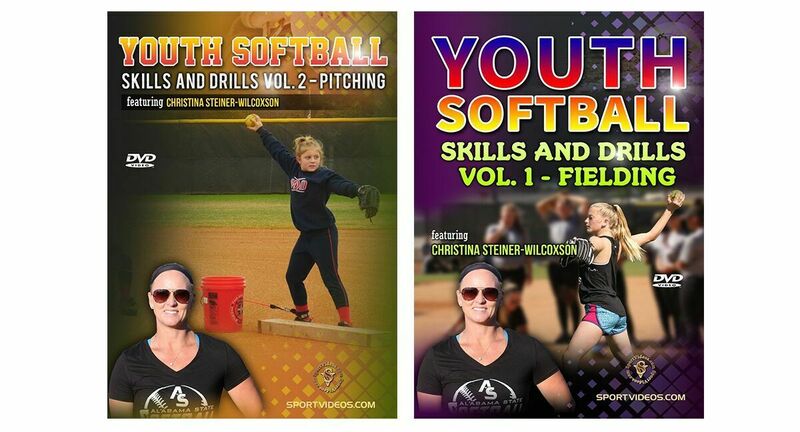 Youth Softball Skills and Drills Vol. 2 - Pitching Coach Christina Steiner-Wilcoxson teaches players key techniques and provides a wide variety of unique training tips for practicing and mastering the basics of pitching. Among the topics covered are: The Grip, Working on the Snap, Leg Drive Drills, Tee Drills, Arm Circles, Walk Through Drills and Pitches.. Each fundamental skill is taught in a progressive manner that will maximize practice time and player improvement. The techniques and training methods in this program have been instrumental in helping to create successful players at all levels! 45 minutes. 2018.